Oscar de la Renta's 2005 ikat-inspired women's collection triggered a world-wide ikat trend in fashion, then interior design. 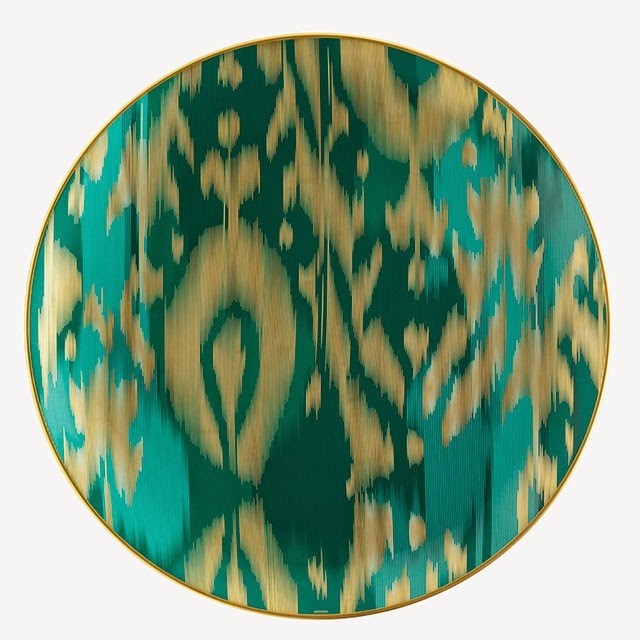 Now Hermès has launched a collection - Voyage en Ikat - that puts ikat firmly on the table. More than twenty hues centred on sapphire, ruby and emerald, are enhanced by 24-carat matte gold and come to life in designs composed "thread by thread". This exquisite collection, which includes platters, presentation trays and tea sets, is hand made by master craftsmen in Limoges, France. It is available for viewing and purchase online. Tashkent-based Rimma Gazalieva, is a leading Uzbek porcelain artist. 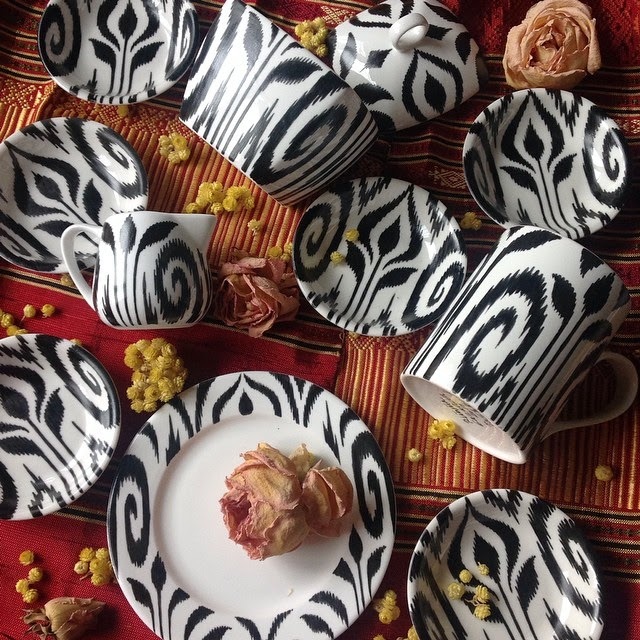 She has been producing tableware inspired by Central Asian design - particualrly ikat and suzani patterns - for many years. Rimma Gazalieva regularly holds master classes in Tashkent. Her pieces, ranging from complete dinner sets to smaller items such as coffee cups and sugar bowls, can be bought at Human Wear in Tashkent, a boutique visited on Uzbek Journeys tours. You can view more samples of Rimma Gazalieva's stunning work on her Facebook page.